Web maps, web site store locators and mobile results are strong drivers of consumers to a business location. Accurate location information is obviously essential to the effectiveness of these drivers. Social networks, directories and search engines (i.e., SEO) are also very valuable delivery agents of consumers. Establishing data continuity and maintaining consistency of location information across these channels can make all the difference between a strong consumer brand experience and a sour one. Many digital media technologies across the ecosystem promise significant enhancements to their services with the addition of location information. SEO and local SEO platforms, directory listing management tools, digital campaigns platforms, landing page systems, call-to-action solutions (e.g. pay-per-call) and analytic solutions all tout the ability to drive additional impact with the inclusion of location information. Inaccurate location information renders local marketing campaigns ineffective. Dirty data in the ecosystem currently has resulted in more than 43% of business listings online being inaccurate and 18% of direction-based searches leading to the wrong location. Dirty data results in profoundly negative consumer experiences, hurting brands at every turn. Dirty data can be characterized as location information that is inaccurate or inaccessible from within the organization, or source. It is information that marketers and other employees are inherently unable to maintain share or distribute across the ecosystem. 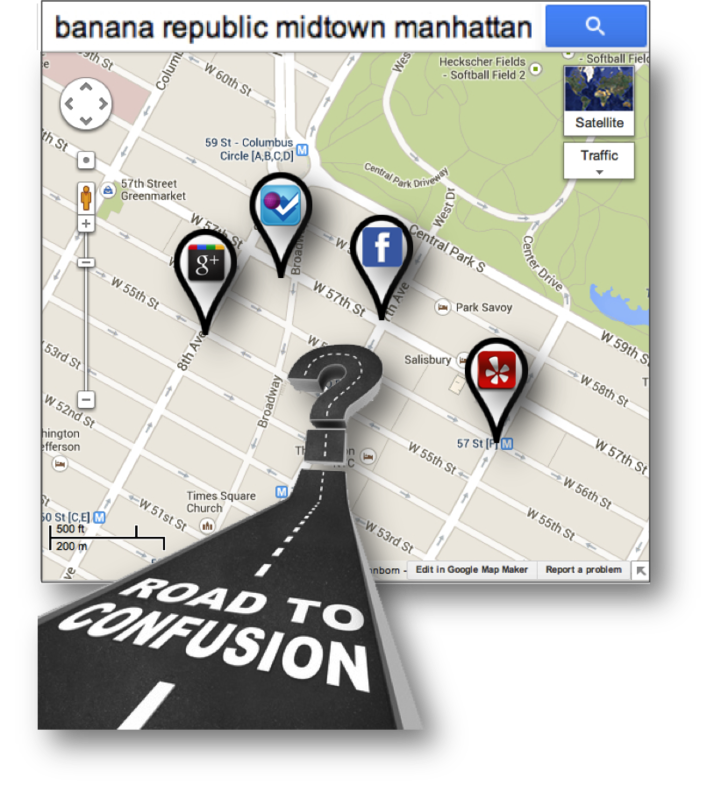 The result is a road to confusion for the consumer, whereby different maps – such as Google, Facebook, Foursquare and Yelp – all pin the same business in a different place on their respective map. The dirty data challenge for enterprise advertisers is bigger and more pervasive than you may think. Location information management is complex. Think about an agency professional managing locations for 8 clients. Let’s say each client advertiser has 1,000 locations, with 5 data changes per month, that need to be syndicated to 30 different targets across the ecosystem each time. That’s over 1.2M data changes every month. That’s not complex, that’s madness! Let’s move past dirty data and onto placeable data. Placeable data is information that an advertiser wants to place strategically online. They may want to place their information on local landing pages, on search engine result pages, on places, profiles and local results. They may wish to place their content on web and mobile maps. Placeable location information is accessible from the source. It is information that can be aggregated from within an organization, regardless of how many different systems or places it is stored or aggregated. Placeable information is accurate, comprehensive and is maintained at a level of reliable consistently. Placeable information is unrestricted and usable across the ecosystem and internally. It eliminates inane, tedious and repetitive busy work across all channels and literally shortens the path to purchase, while improving the customer experience and buoying the brand. In my next post, I will share some of the successful results that our clients have enjoyed as a result of becoming placeable.